Driving the Vios Challenge race car last Thursday gave me yet another lesson in circuit driving. This compact cup car also solidified the fact that low powered cars are as, if not more demanding than fast cars on the circuit. Also, at the end of this post, I’ve highlighted some driving aspects that I feel compelled to share with you. I really can’t wait to see the 40 car grid this coming August in Penang. It’s been too long we’ve not had a street race like that and last weekend’s Bangsaen race just made the craving even worse. 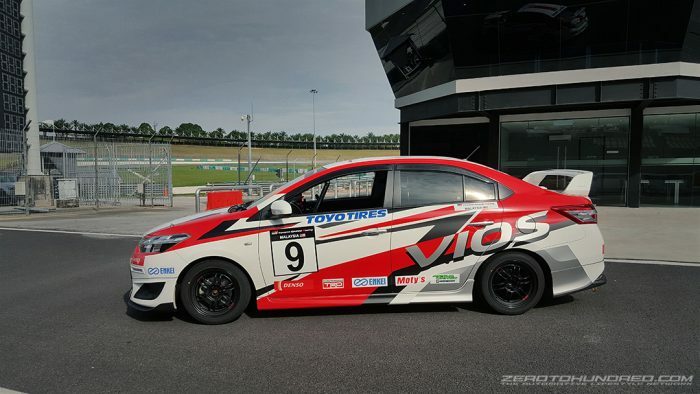 An awesome day out in the Vios Challenge racecar last week! If you didn’t already know, Toyota Gazoo Racing’s inaugural street race is set to commence next month in Penang, so stay tuned! full review and drive story coming soon..
I’ve been eyeing to drive the race Vios since its inception in April. There’s just something about cup cars that excite drivers. Perhaps because it is the perfect benchmark to measure where one ranks in the arena of driving and even more so when the Vios is such a relatable car to many of us. Long story short, just last week I was offered the privilege to sample the famed Toyota racer and needless to say, I was more than thrilled. 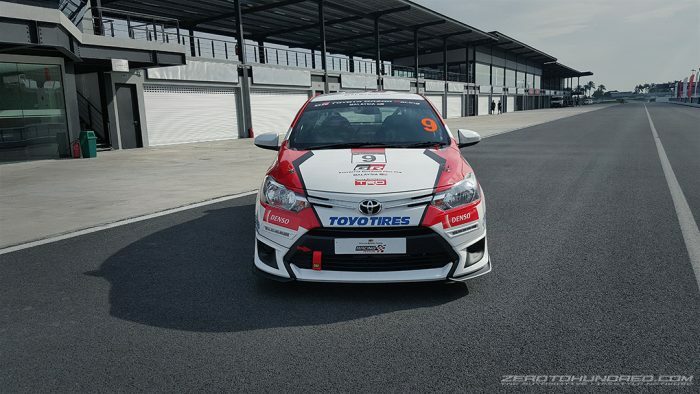 Set at Sepang Circuit’s new South side, UMW Toyota has prepared 10 cup cars for this test day. These are identically specced touring race cars made specifically for the impending Vios Challenge 2017 in August, presented by Toyota Gazoo Racing Malaysia. 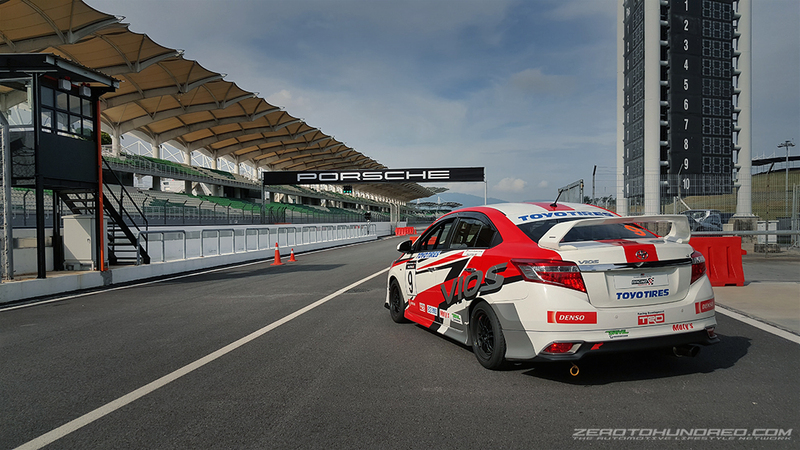 TRD, the renowned motorsport arm of Toyota provides support to Gazoo Racing in their every activity whether it is engineering or expertise and it’s no different with the Vios Challenge. 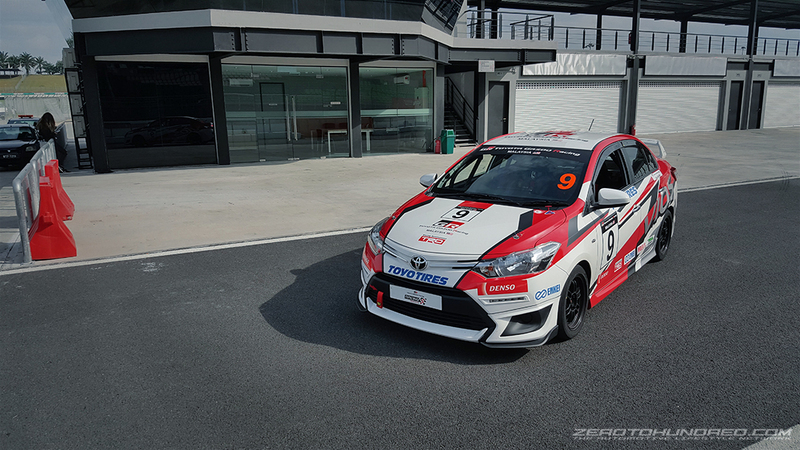 Significant areas of the Vios Challenge were influenced by TRD such as the overall race operation, racecar development and even in street circuit design and so on. 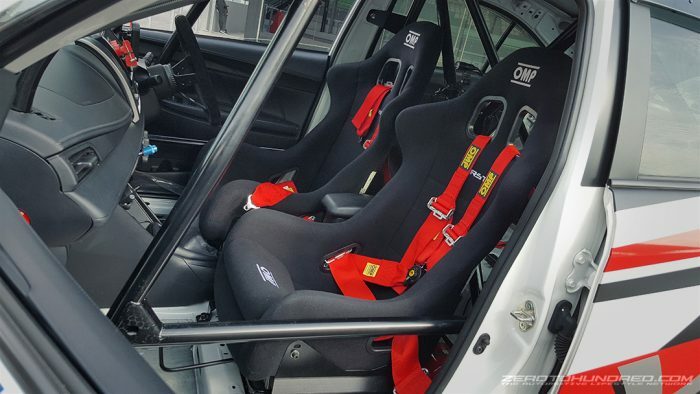 These Vios cup cars begin life as a regular, brand new, manual Toyota Vios 1.5J that were assembled in Shah Alam. 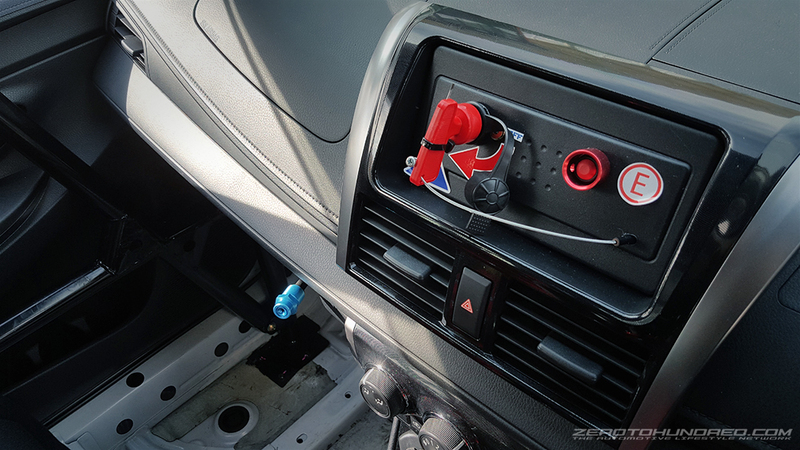 It is then stripped and caged, while retaining factory stock essentials such as the ecu, wiring, dashboard, (cut to fit cage then reinstalled) even the shift knob and foot pedals are stock (except for the aftermarket Works Engineering throttle pedal plate). Performance wise, the 107hp / 140nm 1.5L Dual VVTI engine is left stock but breathes through a TRD exhaust. Other notable performance upgrades are the TRD specced clutch and TRD LSD. 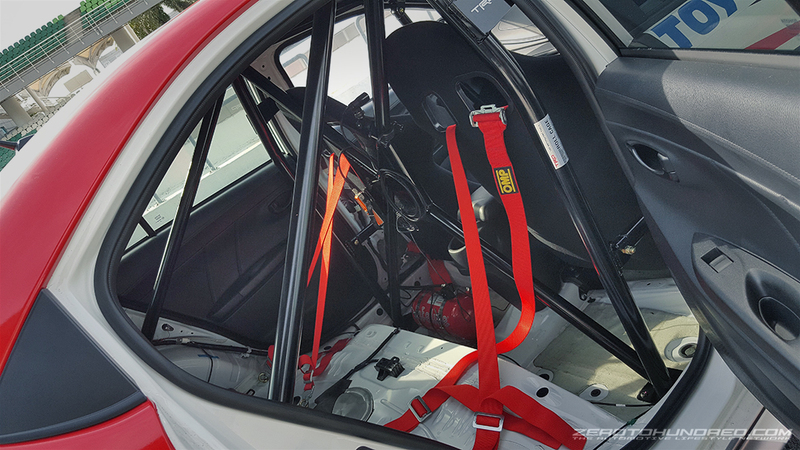 In its chassis, the Vios receive TRD’s suspension system as well as a further increase in rigidity with a TRD front tower and lower brace bars. Enkei RPF1 wheels and uprated brake pads complete this area. 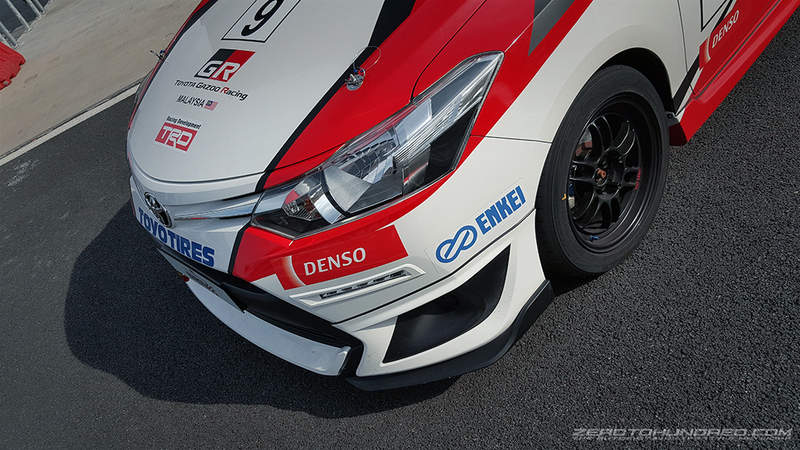 Tyres are strictly Toyo T1R rubbers, adhering to Toyota Gazoo Racing’s controlled tyre regulations. 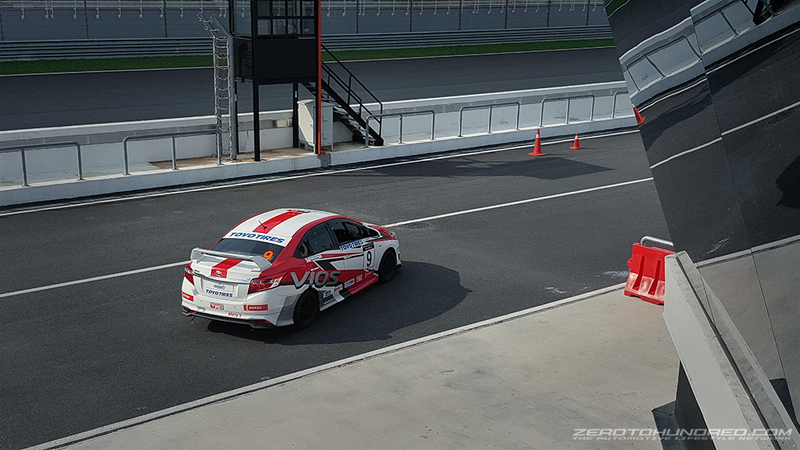 If you didn’t already know, the Vios Challenge racing event is open to the public and I don’t just mean to spectate but to actually race in the Vios racecar. All you need is to purchase the package and possess a valid AAM racing license, which only require a fee and an application. To keep up with high demand, just 2 weeks ago, Toyota Gazoo Racing even added 10 additional cars on top of the initial 30 bringing the total grid to 40 cars. I heard there is 3 more slots left, so if you’re interested, apply now as the inaugural race is only weeks away. The TGR Festival is a huge weekend long carnival that will tour Penang, Johor and twice in KL. All race conversion and the entire race engineering side of the Vios Challenge is contracted exclusively to Wing Hin Motorsports. They’ve done an excellent job at transforming the cars. 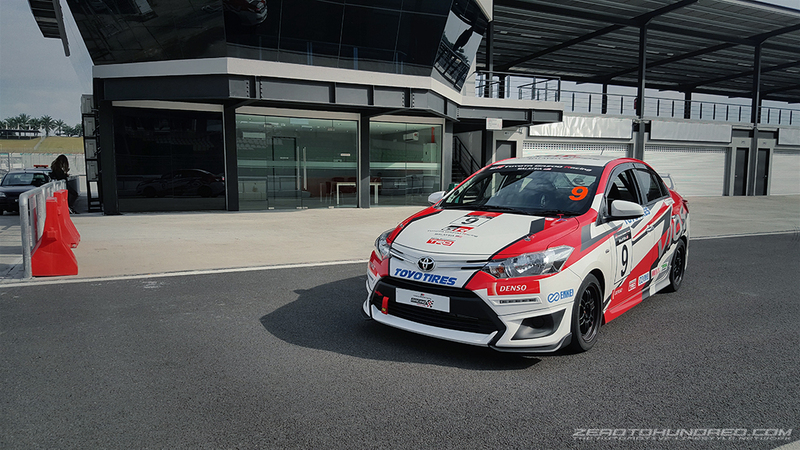 Wing Hin Motorsports is the motorsport arm of Wing Hin, an entity known for their attention to detail, a Toyota loyalist, TRD dealer, and is one of the largest Toyota vehicles dealer in Malaysia. They also field the best pair of Toyota 86 touring cars which I had the extreme privilege to race in and finish at the MMER 12 Hours 2014. Wing Hin Motorsports has made a huge influence in my life since. It was the most amazing experience preparing for the 12 hour race. The many weekends where we spent practicing pit stops before the super elaborate pit setup during race weekend. They are very meticulous. I’ve seen how passionate the entire team can be when motorsport is in operation. However when not in operation, these guys serve as senior managers, engineers, technicians at Wing Hin Automobiles. 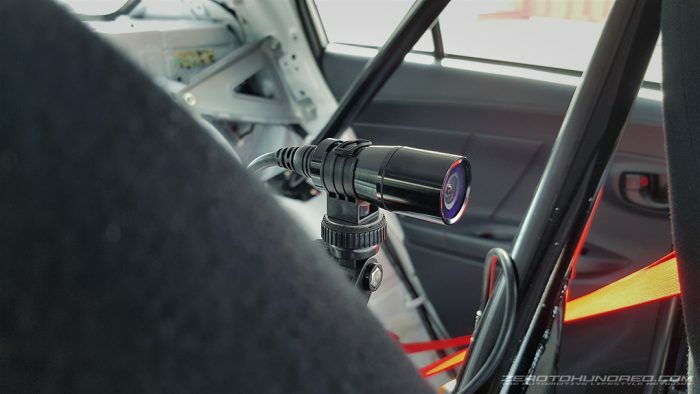 Certain items seen here are only featured in the first 10 car batch, such as the Motec race dash, onboard video equipment, etc. Also, the first 10 gets a pair of OMP bucket seats. 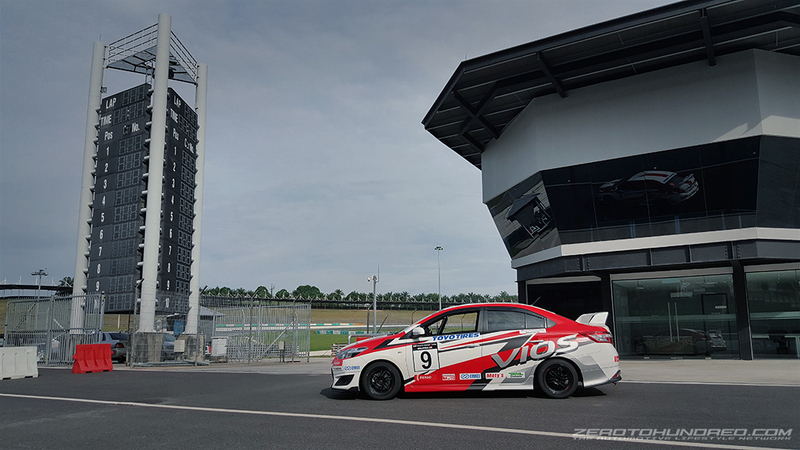 These first 10 are Toyota Gazoo Racing’s first batch of cup Vios cups cars which were used for promotional activities and driver coaching prior to the actual race event. Also, out of the 10 cars, 8 will be celebrity driven. They are made of social figures possessing anywhere from 5 to 7 figure social followers, be it on Facebook, Instagram or YouTube. These guys range from popular Key Opinion Leaders to models to beat boxing master Shawn Lee to Astro artiste Danny Koo. Throughout my experience driving or racing in Sepang, I have only set foot in either full on racecars or road cars, but never in a 100-odd hp 1.5L spec series racecar like the Vios. Let’s face it, there’s about 100hp less in here than other cars i’ve had the pleasure of driving in Sepang so yes, the Vios is not jaw-droppingly fast. It’s a fact. But power isn’t always the point. A race is a race, no matter the platform or car. it’s the vying for top position against the competition, it’s doing your best despite whatever handicap you may have. In this case, it’s coming on top in a single-make, single-spec cup race, fair and square, driven by the motivation to win and above all, skills. Because the Vios Challenge platform is literally an entry level one make series, this means the car must remain as factory form as possible, such as the factory specced engine and basic changes to facilitate driver safety and racing abuse. With about 110hp at my disposal (judging from the TRD exhaust upgrade) and road-use Toyo T1-R tyres on the south circuit half of Sepang, I managed my best lap times of mid 1:26s, which was pretty decent when based against the current test session lap times by other seasoned drivers. However, it did require a handful of laps before I arrive at the stated lap times. It was a matter of learning the Vios and mostly trying to find ways not to lose precious speed, be it when braking for or exiting out of a corner. The Vios is inherently lightweight in the power department, so speed takes effort to build. Any miscalculated judgement or gesture can cause a large speed drop, which will impact lap times significantly. 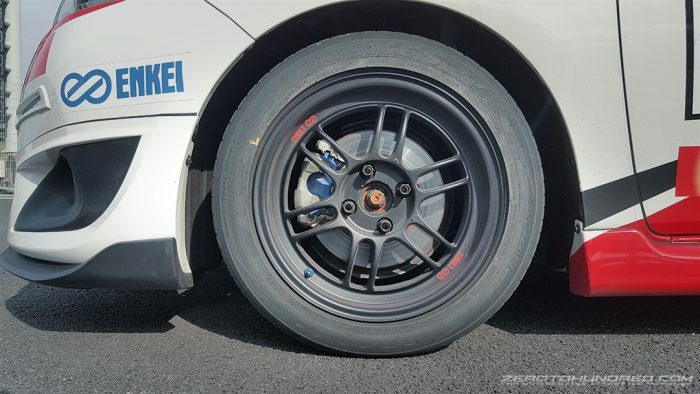 Also, the Toyo T1-R tyre being road specced performance tyre has its own limits. Enter a corner too fast and the Vios will incur the dreaded understeer and subsequently scrub speed. So, to clock a good lap, it was imperative to drive the Vios as cleanly and gracefully as possible. Changing my driving style to fully optimise available power and grip the car had. This meant precise braking without shedding too much speed while being able to power out as soon as possible, for example, in turns such T11 or T14. It’s quite a challenge at first, but was well worth it.